"Philadelphia Athletics" redirects here. For other uses, see Philadelphia Athletics (disambiguation). The Oakland Athletics, a current Major League Baseball franchise, originated in Philadelphia. This article details the history of the Philadelphia Athletics, from 1901 to 1954, when they moved to Kansas City. The Western League had been renamed the American League in 1900 by league president Bancroft (Ban) Johnson, and declared itself the second major league in 1901. Johnson created new franchises in the east and eliminated some franchises in the West. Philadelphia had a new franchise created to compete with the National League's Philadelphia Phillies. Former catcher Connie Mack was recruited to manage the club. Mack in turn persuaded Phillies minority owner Ben Shibe as well as others to invest in the team, which would be called the Philadelphia Athletics. Mack himself bought a 25% interest, while the remaining 25% was sold to Philadelphia sportswriters Sam Jones and Frank Hough. The new league recruited many of its players from the existing National League, persuading them to "jump" to the American League in defiance of their National League contracts. One of the players who jumped to the new league was second baseman Nap Lajoie, formerly of the crosstown Phillies. He won the A.L. 's first batting title with a .426 batting average, still a league record. The Athletics and the American League received a setback when, on April 21, 1902, the Pennsylvania Supreme Court invalidated Lajoie's contract with the Athletics, and ordered him back to the Phillies. This order, though, was only enforceable in the Commonwealth of Pennsylvania. Lajoie was sold to Cleveland, but was kept out of road games in Philadelphia until the National Agreement was signed between the two leagues in 1903. In the early years, the A's established themselves as one of the dominant teams in the new league, winning the A.L. pennant six times (1902, 1905, 1910, 1911, 1913 and 1914), and winning the World Series in 1910, 1911 and 1913. They won over 100 games in 1910 and 1911, and 99 games in 1914. 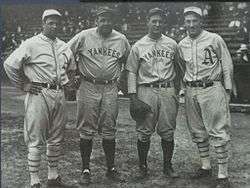 The team was known for its "$100,000 Infield", consisting of Stuffy McInnis (first base), Eddie Collins (second base), Jack Barry (shortstop), and Frank "Home Run" Baker (third base) as well as pitchers Eddie Plank and Chief Bender. Rube Waddell was also a major pitching star for the A's in the early 1900s. According to Lamont Buchanan in The World Series and Highlights of Baseball, the A's fans were fond of chanting, "If Eddie Plank doesn't make you lose / We have Waddell and Bender all ready to use!" Plank holds the franchise record for career victories, with 284. 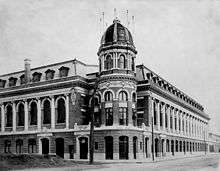 In 1909, the A's moved into the major leagues' first concrete-and-steel ballpark, Shibe Park. This remains the second and last time in franchise history where a new ballpark was built specifically for the A's. Later in the decade, Mack bought the 25% of the team's stock owned by Jones and Hough to become a full partner with Shibe. Shibe ceded Mack full control over the baseball side while retaining control over the business side. In 1914, the Athletics lost the 1914 World Series to the "Miracle Braves" in a four-game sweep. Mack traded, sold or released most of the team's star players soon after. In his book To Every Thing a Season, Bruce Kuklick points out that there were suspicions that the A's had thrown the Series, or at least "laid down", perhaps in protest of Mack's frugal ways. Mack himself alluded to that rumor years later, but debunked it. He claimed that the team was torn by numerous internal factions, and was also distracted by the allure of a third major league, the Federal League. The Federal League had been formed to begin play in 1914. As the AL had done 13 years before, the new league raided existing AL and NL teams for players. Several of his best players, including Bender, had already decided to jump before the World Series. Mack refused to match the upstart league's offers, preferring to rebuild with younger (and less expensive) players. The result was a swift and near-total collapse. The Athletics went from a 99–53 (.651) record and a pennant in 1914 to a record of 43–109 (.283) and last place in 1915, and then to 36–117 (.235, still a modern major-league low) in 1916. The team would finish in last place every year through 1922 and would not contend again until 1925. Shibe died in 1922, and his sons Tom and John took over the business side, leaving the baseball side to Mack. By this time Mack had cemented his famous image of the tall, gaunt and well-dressed man waving his players into position with a scorecard. Unlike most managers, he chose to wear a high-collar shirt, tie, ascot scarf, and a straw boater hat instead of a uniform, a look that he never changed for the rest of his life, even decades after it went out of fashion. This came at the price of Mack not being allowed on-field during games per league regulations. By the latter half of the 1920s, Mack had assembled one of the most feared batting orders in the history of baseball featuring three future Baseball Hall of Fame members. At its heart were Al Simmons, who batted .334 and hit 307 home runs over his major league career, Jimmie Foxx, who hit 30 or more home runs in 12 consecutive seasons and drove in more than 100 runs in 13 consecutive years, and Mickey Cochrane, one of the best-hitting catchers in baseball history. A fourth future Hall of Fame member was pitcher Lefty Grove, who led the American League in strikeouts seven years in a row, and had the league's lowest earned run average a record nine times. In 1927 and 1928, the Athletics finished second to the New York Yankees, then won pennants in 1929, 1930 and 1931, winning the World Series in 1929 and 1930. In each of the three years, the Athletics won over 100 games. While the 1927 New York Yankees, whose batting order was known as the Murderers' Row, are remembered as one of the best teams in baseball history, the Athletics teams of the late 1920s and early 1930s are largely forgotten. Opponents who faced both teams, considered them to be generally equal. Both teams won three consecutive pennants and two of three World Series. Statistically the New York and Philadelphia dynasties were remarkably even: The Athletics had a record of 313-143 (.686) between 1929 and 1931; the Yankees, 302-160 (.654) between 1926 and 1928. And while the Athletics scored six fewer runs than the Yankees—2,710 -2,716, the Athletics had five fewer runs scored against them: 1,992-1,997, a difference of only one run. The Yankees had the best single season at the plate, hitting for a combined .307 batting average and scoring 975 runs in 1927. The Athletics' strongest offensive performance came in 1929, when they batted .296. On defense the Athletics were clearly superior; over their three-year American League reign they committed only 432 errors, 167 fewer than the Yankees. Cochrane was also especially adept at telling his pitchers how to pitch to opposing batters. Many veteran baseball observers believe that the Yankees' far more exalted status in history is due largely to the fact that they played in New York, where most of the national media is located. As it turned out, this would be the Athletics' last hurrah in Philadelphia. The Great Depression was well under way, and declining attendance had drastically reduced the team's revenues. Mack again sold or traded his best players in order to reduce expenses. In September 1932, he sold Simmons, Jimmy Dykes and Mule Haas to the Chicago White Sox for $100,000. In December 1933, Mack sent Grove, Rube Walberg and Max Bishop to the Boston Red Sox for Bob Kline, Rabbit Warstler and $125,000. Also in 1933, he sold Cochrane to the Detroit Tigers for $100,000. The construction of a spite fence at Shibe Park, blocking the view from nearby buildings, only served to irritate potential paying fans. However, the consequences did not become apparent for a few more years, as the team finished second in 1932 and third in 1933. The Athletics finished fifth in 1934, then last in 1935. Mack was already 68 years old when the A's won the pennant in 1931, and many felt that the game had long since passed him by. Although he had every intention of building another winner, he did not have the extra money to get big stars. He also did not (or could not) invest in a farm system. Unlike most other owners, Mack had no source of income aside from the A's, so the dwindling attendance figures of the early 1930s hit him especially hard. As a result, the A's went into a decline that lasted for over 30 years, through three cities. Except for a fifth-place finish in 1944, they finished in last or next-to-last place every year from 1935 to 1946. In 1936, Tom Shibe died, and John succeeded him as club president. However, John resigned due to illness a few months later, leaving the presidency to Mack. When John died on July 11, 1937, Mack bought enough shares from the Shibe estate to become majority owner. However, Mack had been the franchise's number-one man since Ben Shibe's death. Even as bad as the A's got during this time and long after most other teams hired a general manager, Mack retained complete authority over baseball matters, making personnel decisions and leading the team on the field. One of the few times that he even considered ceding some of his duties came in the 1934-35 offseason, when he entertained hiring Babe Ruth to succeed him as manager. However, he backed off from this idea, saying that the Babe's wife, Claire, would be running the team within a month. By the mid-1940s, Mack began showing unmistakable signs of mental deterioration. He would call on players from decades earlier to pinch-hit, lapse into sudden outbursts of temper, or make strange calls that the team would often just ignore. He spent most games asleep in the dugout rather than playing any active part, leaving his coaches to run the team most of the time. Nonetheless, despite calls inside and outside the organization to step down, Mack would not even consider firing himself. Also during this time, Mack gave a minority stake in the team to his sons, Roy, Earle and Connie, Jr. Although Connie, Jr. was several years younger than Roy and Earle (he was the son of Connie, Sr.'s second marriage), Mack intended to have all three of them inherit the team upon his death. He also intended for Earle, who had been assistant manager since 1924, to succeed him as manager. This decision would have dire consequences for the A's later on. To the surprise of most people in baseball, Mack managed not only to get out of the cellar in 1947, but actually finished with a winning record for the first time in 14 years. They contended for much of 1948, even managing to spend 49 days in first place. However, the turning point came on June 13, when pitcher Nels Potter, who had been a solid middle reliever for most of the season, blew a three-run lead in the first game of a doubleheader against the St. Louis Browns. An enraged Mack ordered him off the team in front of a shocked clubhouse after the game. The A's spent most of the summer in either first or second place before fading to fourth, and Mack's abrupt dismissal of Potter is often cited as costing the A's a pennant. They would not be a factor in a pennant race again at that late date until 1969—their second year in Oakland. Another winning record in 1949 sparked hopes that 1950—the 50th anniversary of both the American League and Mack's tenure as manager of the A's--would bring a pennant at last. During that year, the team wore uniforms trimmed in blue and gold, in honor of the Golden Jubilee of "The Grand Old Man of Baseball." However, the 1950 season was an unmitigated disaster. They were only above .500 once all season (at 3-2), and a 5–17 May ended any hope of contention. Before May was out, Mack's sons had agreed to ease their father out as manager. On May 26, Jimmie Dykes was named assistant manager, with control over the A's day-to-day operations. It was further decided that Mack would resign after the season, and Dykes would be named his successor. On the same date, Cochrane, who had been brought back as a coach earlier in the year, was named general manager, stripping Connie, Sr. of his last direct authority over baseball matters. Ultimately, the A's finished with the worst record in the majors at 52-102, 46 games out of first. Mack's 50-year tenure as manager is a North American professional sports record that has never been threatened. In the late 1940s, a power struggle developed between Roy and Earle on one side and Connie, Jr. on the other. Connie, Jr., like many A's fans, had become disgusted with his brothers' bargain-basement approach to running the team. However, Roy and Earle were not willing to modernize and refused to listen to their younger brother, whom they considered a mere child with no relevant opinion (Connie, Jr. was almost 20 years younger than Roy and Earle). Compounding their disagreements was the fact that they had different mothers. When it was apparent that Roy and Earle would not consider making what he considered to be critical reforms, Connie, Jr. and his mother (who was angered at Connie, Sr.'s refusal to give Connie, Jr.'s sisters any role in the team) made an alliance with the Shibe heirs. Connie, Jr. began taking steps to upgrade the team and the park. One of the few things on which the two sides agreed was that it was time for Connie, Sr. to step down as manager. Matters came to a head in July 1950, when Connie, Jr. and the Shibes decided to sell the team. However, Roy and Earle insisted that they have a 30-day option to buy out Connie, Jr. and the Shibes before the team was put on the market. Connie, Jr. didn't think Roy and Earle could get the $1.74 million required to buy him out, but Roy and Earle called their bluff by mortgaging the team to Connecticut General Life Insurance Company (now part of CIGNA) and pledging Shibe Park as collateral. The mortgage deal closed on August 26. The shares of Connie, Jr. and the Shibes were retired, ending the Shibes' half-century involvement with the A's and making Connie, Sr., Roy and Earle the team's only shareholders. Although his father remained nominal owner and team president, Roy, who had been vice president since 1936, now became operating head of the franchise, sharing day-to-day control with Earle. However, under the terms of the mortgage, the A's were now saddled with payments of $200,000 over the first five years, depriving them of badly needed capital that could have been used on improving the team and the park. Unfortunately for the A's, the team continued to slide on the field. Although the 1949 team set a major league record for double plays which still stands, this was more a reflection of the team's poor pitching staff allowing too many base runners. They would have only one winning record from 1951 to 1954—a fourth-place finish in 1952. The nadir came in 1954, when the A's finished with a ghastly 51-103 record, easily the worst record in baseball and 60 games out of first. Attendance plummeted and revenues continued to dwindle. At the same time, the Phillies, who had been the definition of baseball futility for over 30 years, began a surprisingly quick climb to respectability. The A's had always been the more popular team in Philadelphia for most of the first half of the century, even though for much of the last decade they had been as bad or worse than the Phillies. However, unlike the A's, the Phillies began spending lavishly on young prospects in the 1940s. The impact was immediate. In 1947, the A's finished fourth in the American League while the Phillies tied for the worst record in the National League. Only three years later, while the A's finished dead last in the majors, the Phillies went all the way to the 1950 World Series. It soon became obvious that the Phillies had passed the A's as Philadelphia's number-one team. In response, Roy and Earle began cutting costs even further. They turned over the rent from the Phillies to Connecticut General and took cash advances from their concessions contractor. The cost-cutting ramped up even further in the 1953–54 offseason, when they slashed over $100,000 off the player payroll, fired general manager Arthur Ehlers and replaced Dykes as manager with shortstop Eddie Joost. They also pared down the minor-league system to only six clubs. However, even with these measures, there wasn't nearly enough money coming in to service the mortgage debt, and Roy and Earle began feuding with each other. Despite the turmoil, some Athletics players shone on the field. In 1951, Gus Zernial led the American League with 33 home runs, 129 runs scored, 68 extra-base hits, and 17 outfield assists; in 1952 he swatted 29 homers and bagged 100 RBI; in 1953 he hit 42 homers and drove in 108 runs. In 1952, left-handed pitcher Bobby Shantz won 24 games and was named the league's Most Valuable Player, and Ferris Fain won AL batting championships in 1951 (with a .344 average) and 1952 (with a .320 average). His 1952 batting crown remains the last time an Athletic has led the league in hitting. Joost was a solid fielder who had a good eye at the plate for generating walks and had an above-average on-base percentage as a result. All four players represented the American League in the All-Star Game. Shantz might have won 30 games his best year 1952 but was hurt by a pitched ball on the wrist and was finished for the season. By the summer of 1954, it was obvious that the A's were on an irreversible slide into bankruptcy. Earle and Roy decided that there was no choice but to sell their father's beloved team, and it was with great sorrow that the old man gave his approval for the sale. Although several offers were put forward by Philadelphia interests, American League president Will Harridge was convinced that the team could never be viable in Philadelphia. The sparse crowds at Shibe had been a source of frustration for some time to the other AL owners, as they could not even begin to meet their expenses for trips to Philadelphia. As a result, Harridge had come to believe that the only way to resolve the "Philadelphia problem" was to move the Athletics elsewhere. For this reason, when Chicago businessman Arnold Johnson offered to buy the team, the other owners pressured Roy Mack to agree to the sale. Johnson had very close ties to the Yankees; he not only owned Yankee Stadium but also owned Blues Stadium in Kansas City, home to the Yankees' top farm team. Johnson intended to move the A's to a renovated Blues Stadium if he was cleared to buy them. The Yankees made no secret that they favored Johnson, and their backing gave him the upper hand with the other owners. 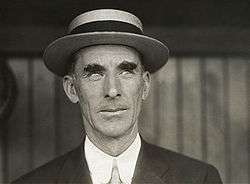 After an October 12 owners meeting at which several offers from Philadelphia interests were rejected as inadequate (Harridge later said that while several of them "talked about millions", they didn't have any money behind them), Mack agreed in principle to sell the A's to Johnson no later than October 18. However, on October 17, Roy Mack suddenly announced that the A's had been sold to a Philadelphia-based group headed by auto dealer John Crisconi. The deal was to be approved at an American League owners' meeting on October 28. It looked headed for approval when rumors (reportedly planted by the Yankees) cropped up that the Crisconi group was underfinanced, and Johnson collared Roy Mack at Roy's home to persuade him that his original deal was better in the long run. On October 28, the sale to the Crisconi group came up one vote short of the five needed for approval, with Roy Mack voting against the deal he'd just negotiated. A day later, Connie Mack released an open letter to A's fans (one that was likely written by his wife) blasting the owners for sinking the deal to the Crisconi group. However, he conceded that he didn't have enough money to run the A's in 1955, and the Johnson deal was the only one that had any prospect of winning approval. A few days later, the Macks sold the A's to Johnson for $3.5 million--$1.5 million for their shares plus $2 million in debt. Selling Shibe Park—which had been renamed Connie Mack Stadium a year earlier—proved more difficult, but the Phillies reluctantly bought it. The American League owners met again on November 8, and duly approved Johnson's bid to buy the A's. Johnson's first act was to request permission to move to Kansas City. This proved more difficult, since it required a three-fourths majority. However, Detroit owner Spike Briggs was persuaded to change his vote, ending the A's 54-year stay in Philadelphia. ↑ "Seeks to snare Duffy of Boston". Chicago Daily Tribune. January 29, 1901. p. 9. 1 2 "John Shibe bio". Philadelphia Athletics Historical Society. Archived from the original on October 12, 2011. 1 2 Fitzpatrick, Frank (June 26, 2011). "Golden era for Phila. baseball? : Yes, it is. But the city also had three others". Philadelphia Inquirer. Philadelphia media Network. Retrieved 2011-06-27. 1 2 3 4 5 6 7 8 9 10 11 12 13 14 15 16 17 Mann, Jack (August 19, 1996). "Lost In History". Sports Illustrated. Retrieved January 23, 2016. ↑ "Lefty Grove at the Baseball Hall of Fame". baseballhall.org. Retrieved 23 January 2016. 1 2 3 4 5 6 7 8 Warrington, Robert D. Departure Without Dignity: The Athletics Leave Philadelphia. Society for American Baseball Research, 2010. ↑ "A Record with Legs: Most Double Plays Turned in a Season". philadelphiaathletics.org. Retrieved 23 January 2016.